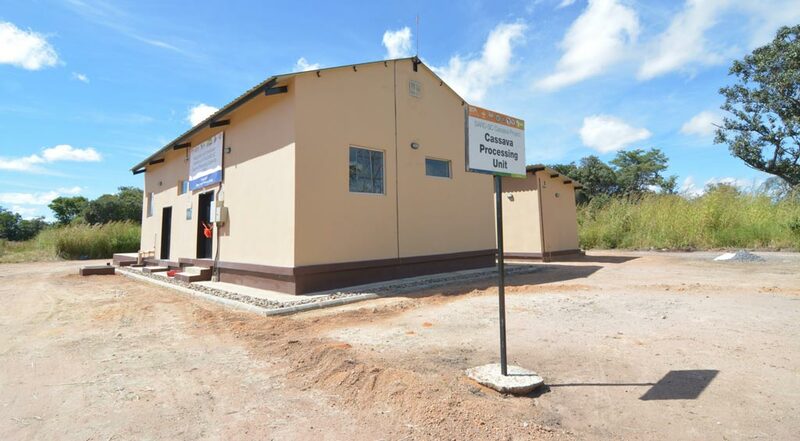 The processing center is part of the project’s commitment to support ZARI in developing the country’s cassava industry. The cassava processing center is equipped with a mechanized cassava grater, presser, firewood-fuelled fryer, sieving machine, and high-capacity milling machine. It also has an office, workers’ washroom, loading and drying dock, and cassava washing bay. The center can process 5 tons of fresh roots daily into chips and high-quality cassava flour (HQCF), among other products. 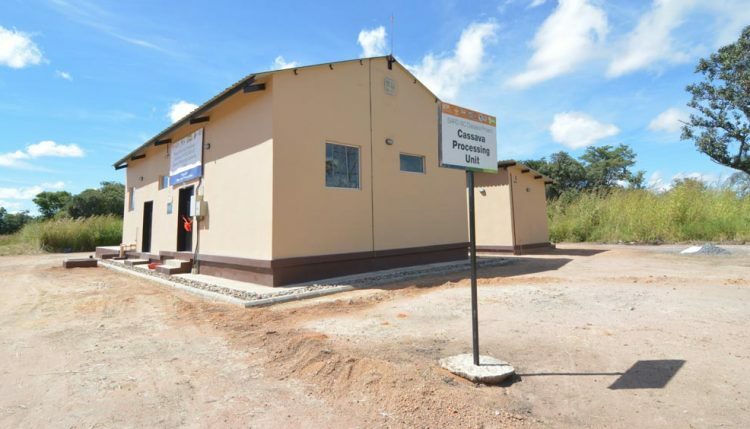 The cost of building and equipping the center was about 1.2 million Zambian Kwacha (US$120,000). IITA/SARD-SC cassava processing center building at ZARI-Mansa. The handover and commissioning event was attended by representatives of IITA, ZARI, AfDB, and the provincial government, as well as by cassava farmers, farmers’ associations, and the media. Rody Chakaba, Mansa District Commissioner, gave the keynote address. “Later you will see and sample some of the food products that could be produced from this center, which have been prepared by local women and members of the Zambia IITA Youth Agripreneurs,” he explained. Lewis Bangwe, AfDB representative, added that the establishment of the processing center “is aimed at helping address some of the gaps in agriculture in Zambia: the lack of crop processing infrastructure, weak capacity in practical areas of agricultural research, and non-interest/non-participation of youth in agricultural activities. The Bank is proud to be associated with IITA and ZARI, which are partnering to implement SARD-SC that is helping to develop the cassava sector in the country. This center is a concrete manifestation of the Bank’s commitment to help improve the plight of Zambian smallholder farmers,” Bangwe added. “I also thank the AfDB for supporting this initiative. Farmers cannot continue to be just raw material suppliers and expect their plight to improve. For farmers to move forward—and for our youth to take over agriculture from us old people—we need to show that better income could be realized by processing cassava into high-value products. This is what this facility is for,” he added. “This facility symbolizes the livelihoods potential of cassava and the people that depend on it…I officially declare this center open,” he concluded.